Yesterday, there were big clashes at Qalandia checkpoint and the refugee camp. There were hundreds of kids out there protesting the recent Israeli actions regarding Al Aqsa mosque. There is a widespread fear that the escalating Israeli invasions of the Al Aqsa compound and the opening of a new synagogue (Hurva) which represents the national-political Jewish movement’s goal of reclaiming Jerusalem (and Al Aqsa) for their eternal capital. There was also supposed to be an ultra-orthodox Israeli march around Al Aqsa where they put the cornerstone down for the third temple–symbolizing the end of Al Aqsa and the beginning of the end times. The Israeli soldiers respond to the stones with rubber coated steel bullets, live ammunition, and teargas canisters shot at head level. The soldiers take positions on top of some apartment buildings in the refugee camp to shoot at the kids below. Yesterday, the soldiers invaded a home on the third floor of the building and started beating 25 year old Abdullah Lafee. After they beat him to the point where his face was cut and bleeding, they pushed him off of the balcony–on the third floor. But they weren’t finished yet. The soldiers went down to where he fell and continued beating him there. He is still alive and in the hospital recovering. At Atara checkpoint, between Birzeit and Ramallah, there was a demonstration where a soldier was injured by a stone. The soldiers ended up shooting more than 20 Palestinians rubber coated steel bullets–including one in the head–a serious injury. I had the CRAZIEST day yesterday…. So my roommate Lazar and me are going to Jerusalem to Al Aqsa mosque in the old city because there were clashes all day long between Palestinians and Settlers/Israeli police. The settlers were trying to set Al Aqsa on fire, and the Imam of the mosque used the loud speaker to call all the Muslims to defend the mosque. Then the police cut the electricity to the mosque. INSIDE the mosque, the Israeli police/military were shooting teargas and sound bombs and the Palestinians blockaded themselves inside the mosque. 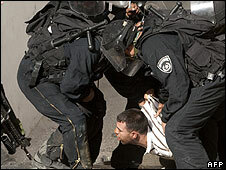 There were several injured, and the Israeli police beat and arrested several journalists. Afterwards, there were clashes all around Old City between kids throwing stones and Israeli police/military/special forces…..so we wanted to go and document what was happening. We get to Qalandia, and we’re already pretty late so we’re in a hurry. We get through the narrow, barred passageway, through the first turnstyle, then we get to the lanes where the 18 year old girl soldiers check our passports/IDs. Out of 6 lanes, of course only 2 are open. So we choose the far one….and wait. Then a Palestinian girl who looks about my age, in a hijab, goes through and puts her purse through the xray machine, walks through the metal detector, and shows her ID to the soldier behind the bullet proof glass. The soldier is screaming at her in a high, shrill voice over the loud speaker in Hebrew–which the girl can’t understand. Finally, after like 15 minutes of just screaming at this poor girl, a man from the line yells to the soldier that he can speak Hebrew and he will translate. So the soldier lets him through the turnstyle. He goes up and tells the girl the soldier wants her to put her purse through the xray machine again….so she does. And goes back to the soldier who yells at her to xray it again. So she xrays her bag again…then picks it up on the other side and looks at the soldier. The soldier yells something else in Hebrew, and the man translating says she wants the girl to empty out her bag in front of the window….so she takes out each object she has in her purse, one by one, throws it on the ground, then picks them all up one by one, showing each one to the soldier. The soldier is still not satisfied. She screams to the girl to take out the lining of her purse. So the man translates and pulls the lining inside out so the soldier and see…and there is a swiss knife in the bottom of the lining. All of a sudden theres three gorilla sized Israeli soldiers surrounding this girl. The man translating disappears. And the gorillas tell the girl to go to the xray machine and x-ray the bag and the knife again. When the come out on the other side, the gorillas start going through her stuff piece by piece again. Its been a half and hour since this whole scene started. Lazar tries to go take pictures and the soldiers look at him menacingly so he stops. So all the Palestinians around me are running to the furthest corner of this cage we are trapped in with this girl who might have a bomb….so me and the 5 other internationals who were already edging our way out because of the guns shoot to the furthest corner we can get too….and there is just one man standing in the lane with a small child. From where I am, I can hear the soldier beating the girl and her yelling and crying. Then more soldiers rush in from every direction. And some of them start beating the man with the small child who was just standing there. Then a lot of the Palestinians go back into the lane to try to defend this guy and his child. Then the soldiers start pushing and beating the people back away from this area. We all huddle in another corner because we’re still trapped in this part of the checkpoint. All the internaitonals and some Israeli peace activists who happened to be there start taking pictures of what is happening. Then the soldiers start pushing the people with cameras and threaten to beat or arrest them and try to break their cameras. So we all go back to the corner again, and finally, they unlock the turnstyles and we go back out to the Ramallah side of the checkpoint. From there, I can still see the soldiers beating the man with the small child. I cant see or hear the girl anymore. Then they take the man and the child through to a small room and we dont see them again either……..
Later, when we looked at Lazar’s pictures, we saw one where one of the gorillas raised his gun over his head and was about to hit the girl with it, in the background, one soldier is falling backwards and the swiss knife is on the ground….with the “bottle opener” out…not a knife….so I dont know for sure if she stabbed him or not. But if she did I dont think she planned too….she was going through the checkpoint with a guy–maybe her friend, brother, or husband and they were talking through the bars as the soldier was messing with her, and he was trying to keep her calm. So after waiting to see if anything else happened at Qalandia, we decided to head on to Jerusalem. Obviously, they had closed down Qalandia after this “terrorist attack” so we got on a bus with some of the other Palestinians from the checkpoint and went through a different checkpoint called Hizma which is half an hour out of our way. We get through that checkpoint and make it to the Old City. We were trying to find an open entrance to Al Aqsa mosque so that we could see if there was any people still barricaded inside the mosque. Every entrance we tried, the big door was closed and locked (the door to the compound/plaza around the mosque) and in front of that was an Israeli police barricade with soldiers in front. Finally we go to an overlook of the Western Wall where we can see the mosque (since its right beside it) and we can see Israeli special forces climbing on roofs around the mosque. And we keep going up the street until we see a crowd of people in this intersection. Ahead of us across the intersection are Palestinians hiding behind a wall and peaking their heads out every once in a while down the alley. On the right side of the intersection, there is a group of Israeli soldiers in full riot gear with full length shields, in formation like a phalanx or the Roman legions or something like that. Since the road is narrow, they are standing like 5 across and 5 deep, just waiting like that in front of this entrance to Al Aqsa. Down the alley they are facing, the one that the Palestinians across the intersection keep looking down, about 100 meters away are some shadowy figures of Palestinian kids and teenagers, and they are throwing stones and anything else they can find towards the soldiers. But they are really far away so a stone only makes it to this intersection about once every 5 mintues. The soldiers, behind their riot gear, look very VERY scared. Of kids with stones, 100 meters away. The Palestinians standing around with us are just kind of joking and laughing about it. We decide to find a better spot to take pictures and to try to get closer to the shabaab (kids) throwing stones down the alley. So Lazar goes around and finds a park area that overlooks the street, just about right in the middle of the whole scene. To out left is a small staircase where Israeli special forces are waiting to run out and go get the kids. They also look very scared. As we’re waiting and taking pictures, three small Palestinian kids join us and Im showing them how to take pictures on my camera when the soldiers to our left run out into the alleyway. Then they form the phalanx again, and have the shields in the front line of their group and they stop right below us, in formaition. Now the kids down the alley have a closer target and they start throwing stones again. The phalanx moves back a few feet. Then another stone rolls up to them, and they move back a few more feet. The kids tell me , “Hum zay bissat! zay bissat!” (They are like cats) haha the kids were making fun of them for being scared of some kids with stones while these are special forces soldiers in full riot gear with full length shields. Yeah….they should have been really scared. So they back up all the way to the intersection we were at before and we thought they were going to keep retreating, when suddenly they all run down the alleyway towards the kids with stones. Lazar jumps down into the street and follows taking pictures. The three kids with us follow him, so I follow them and we’re all running down this narrow alleyway with the special forces ahead of us, beating the kids who were throwing stones and a huge brawl there. Within a few minutes, the street is quiet and the special forces have disappeared to some new dark corner to lurk in….and behind us are the other group of soldiers by the entrance to Al Aqsa, who could shoot teargas or rubber bullets at us at any time, the three kids are still with me, and Lazar has gone forward. Ahead of us, in the shadows, are the figure of three people in masks, plainclothes, and with big guns. On the ground is a Palestinian boy around 15 year old. We think the guys are Palestinian since they’re wearing masks and no uniforms, anyways, I stop with the kids far from this. And Lazar goes forward….as he gets closer with his camera, one man in a mask points his gun at Lazar and yells at him to go. So Lazar ducks down a side alleyway and I follow with the children. We hide out there for a minute, then something falls beside me from the roof–its a big metal sheet, then rocks and glass is falling. And we look up to the roof and its a guy in a mask. We think he is Arab and the kids shout up in Arabic, “We’re Arabs! We’re with you! Stop throwing stones at us!” But he keeps throwing stuff at us so we run up the alley way. We get up the alleyway then try to find a way back down to the street. We find another side street that leads to the street all of this was happening on and we peak our heads out to see whats going on. Down to the right, the first phalanx of Israeli soldiers is still standing there waiting. Down to the left, where the masked men and Palestinian boys were there is no one. One of the kids with us goes out into the alley and throws a small stone towards the soldiers, but it doesn even make it half way to them. Suddenly, they shoot something at this kid and he runs back to us crying. Hes like 8 years old. I thought maybe they shot him with something because he was holding on to his leg but I didnt see anything and he said he was ok…so we moved back up this side street, trying to find a way out of this mess. Ahead of us, in this dark alleyway, we see a bright flashlight pointed at us and dark shadowy figures behind it. We dont know what to do. We can’t go back into the street because they will shoot at us, theres guys on the roofs in masks throwing stuff down onto us in the other direction, and up the street is a very scary group of people, standing there silently behind this flashlight. With no other option, and with these three kids, we start slowly walking towards this flashlight. Its silent, they dont yell or say anything to us, just move the flashlight slowly up and down. So Lazar walks first, slowly and with his hands up in the air, saying “Press!” I follow with the kids and we all have our hands up in the air. As we get closer to the light I can tell its the special forces group, lurking in a new alley. And they dont say anything to us as we pass or even look at us. Then , when we get past them, they charge down the alley way and into the street below. If we had been like 10 seconds later we would have turned up the alley right as they charged. It was really, really scary. After that we decide, enough is enough, and we try to find our way back to the first intersection….the kids go back to their houses and we make it back to the entrance to Al Aqsa. The soldiers are gone. And everything is quiet. We go back down the street to the spot where the kids were throwing stones from earlier and theres some medics and other Palesitnian men standing around there. We ask them what happened and they said, “There were just some young kids here, throwing stones down the street. Then they sent in all these soldiers and mustaghribeen (?spelling) which are plainclothes Israeli soldiers –the guys we saw wiht the masks– and they beat up the kids and arrested 3 or 4 of them. Later when we were walking around and talking to people, we met this Palestinian couple. The man said he was inside the mosque that morning when all of the clashes were happening and the Israelis blockaded them inside. He said they beat a lot of Palestinian journalists, kids, and shot a few people with rubber bullets and wouldnt let the paramedics inside to help them. Anyways….they expect more problems today because the Israeli settlers keep invading the mosque and trying to set it on fire. So Palestinians go to do a sit in at the mosque to protect it. Then the Israeli police/military escorts the settlers (or “tourists” as the Israeli report says) into the mosque so they can destroy it. Then the Palestinians come out to defend it and there are clashes. Thats pretty much how it works. If the Israelis and settlers would just stay out of Al Aqsa there would be no problems around the Old City. But they keep pushing it. Ever since the Jewish holidays began, Rosh Hashana, Jewish New Year, Yom Kippur and now Sukkot– there has been a lot of trouble in East Jerusalem which has contributed to the already high tensions due to the Israeli government’s plan to Judaize East Jerusalem–internationally considered part of the Palestinian occupied territories. The Israeli government has been handing out eviction notices left and right to Palestinian families in the Sheikh Jarrah and Silwan neighborhoods of E Jerusalem who have lived there for centuries–so that Israeli settlers can move into their houses. Since the Jewish Holidays began a few weeks ago, the Old City has become even more occupied than usual. Every time I have walked past the Damascus Gate and the rest of the Old City it has been surrounded by Israeli police and military–and gates have been set up to prevent Palestinians from entering the Old City (this is technically occupied territory–and besides settlers, is populated by the original pre- 1948 populations of Arab christians, muslims, and jews) . Instead of seeing Damascus Gate busy and full of Palestinian vendors and buyers, it was empty except for Israeli settlers and orthodox being allowed past the police. Since the Al Aqsa mosque, the third most holy site in Islam, is located on the old Jewish temple mount in the Old City, many Israelis–especially the orthodox and settlers (the most extreme of Israelis) have used the Israeli police and military to invade the Al Aqsa compound without permission or even trying to coordinate beforehand. The 2nd Intifada (or Al Aqsa Intifada) began in 2000 after Ariel Sharon forced his way into Al Aqsa on Yom Kippur. History repeats itself every year as settlers and orthodox break into the compound on Yom Kippur (and other holidays), with the Israeli police and military supporting them. In order to “make it safe” for the settlers and orthodox to break into Al Aqsa, the police and military have to blockade the entire Old City. They dont allow in any Palestinian males under the age of 50. And if they live in the Old City, they are forced to stay inside, during “curfew periods” to allow the Israelis safe passage through the Muslim quarter. Because of all of this, the Palestinians–along with the Jerusalem Christians–have protested these Israeli policies and have organized a kind of “sit in” at Al Aqsa to protect the holy site. The Israeli police and military responded to this by blockading them inside for days. On Fridays, when Palestinians who have the Jerusalem ID want to go and pray in Al Aqsa, the Israelis closed the checkpoint. Yesterday there was a huge clash at Qalandia- the checkpoint from Ramallah to Jerusalem. Many Palestinians trying to go to Jerusalem were stopped at the checkpoint, then a crowd and traffic gathered. Finally, clashes broke out between the Shabab (young boys) and the Israeli soldiers not allowing them their right to go to Jerusalem and Al Aqsa. Qalandia was like a war zone. Stones and concrete blocks in the middle of the road (and its a main road that goes in front of Qalandia–leading to Jericho, Bethlehem and Hebron…). Soldiers were shooting teargas at passing traffic, business and homes near the checkpoint. They shot rubber coated steel bullets and maybe some live ammunition at the protestors, injuring several. Meanwhile, Israeli PM Benjamin Netanyahu said talks with US envoy George Mitchell were “constructive”. Mr Mitchell was due to meet with Palestinian leader Mahmoud Abbas on Friday, and to hold further talks with Mr Netanyahu’s aides on Saturday. US attempts to restart peace negotiations appear to have stalled over Israel’s refusal to meet US and Palestinian demands that it freeze all settlement activity in the West Bank. The Palestinian Authority has accused Israel of seeking to “Judaise” East Jerusalem, and of allowing extremists access to the al-Aqsa mosque compound while denying it to Muslims. The Islamist group Hamas had called for a “day of rage” on Friday, local media said, while its rival Fatah had urged a strike and peaceful protests in support of the mosque. The Islamic Movement – a political organisation based in Israel – had urged Muslim citizens of Israel to flock to Jerusalem to “defend al-Aqsa”.